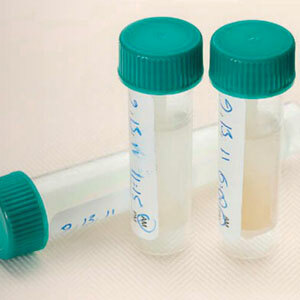 For over a century now, health providers have depended on blood and urine samples to diagnose many forms of disease. Very soon, though, we may routinely use a different bodily fluid that's easier and cheaper to collect: saliva. Secreted by six hundred or more glands in the mouth, saliva performs a number of important functions for digestion and overall oral health. Saliva lubricates the mouth to make food easier to swallow. Its enzymes begin the digestion process breaking down food even before we swallow. It also helps wash out food particles that could build up as plaque on the teeth and harbor disease-causing bacteria. In terms of dental health, its greatest role is as a neutralizer of food acid. It's natural after we eat for the acid levels in the mouth to rise above normal. If acid remains in contact with enamel for an extended period of time it can soften the enamel's minerals and make it easier for them to erode. Within thirty minutes to an hour after eating, saliva neutralizes acid and restores the mouth's normal pH level. Saliva also contains calcium and phosphate materials, which helps restore some of the minerals the enamel may have lost from the acid contact. But we're discovering saliva can do even more: we can now use it as an indicator for certain conditions in the body. Like blood or urine, saliva contains molecules that can serve as biological markers for different types of disease. By employing devices calibrated to detect these markers, we can use saliva to uncover cancer, diabetes or other systemic conditions. As these particular devices are manufactured and become more available, the use of saliva for disease diagnosis will rise. In the future, you may not need a trip to the bathroom or wince at a needle stick — a swab of your saliva will do!